We're back. We hope you're sitting down, and that you've finally caught your breath from Top Suspense, our first bestselling anthology. You're about to take another screaming thrill ride with twelve master storytellers. Each Top Suspense Group author is an award winning, highly acclaimed pro whose compelling and unforgettable tales have been published all over the world--and, in some cases, have even become blockbuster movies and TV shows. 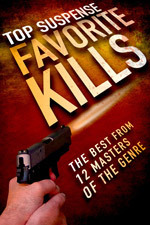 In this book, Favorite Kills, we've collected our very best short stories. All major prize-winning tales and personal favorites, each one a knock-out punch of suspense.